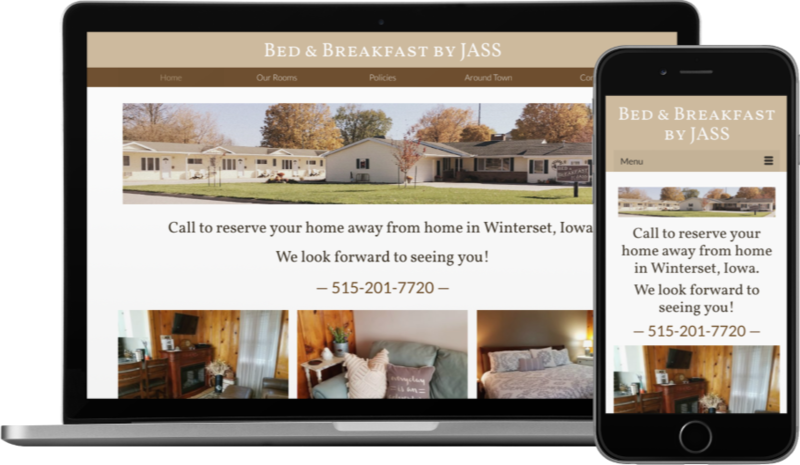 Bed & Breakfast by JASS is a quaint and rustic-chic property conveniently located on the north side of Winterset in Madison County. Although it had been in business for several years, they only had a Facebook page for some time, and felt they might be missing some opportunities by not having a website. Having a website in addition to a Facebook page allows you to showcase information in a layout that makes sense for your business, and leads people through your whole story instead of just what’s happening right now. In this case, the website allows them to feature full-size images of the beautifully decorated rooms in their renovated historic property. It also answers frequently asked questions about their policies. The owners have reported a great increase in bookings now that people can see the details of the property, and their online visibility on Google has improved too.